The Ultraverse is a dead universe. For now, hopefully. That means no new comics have been produced since 1996, but that also means there is a finite amount of books to collect. And the good news is that most of these books can be found on the cheap. My contribution to the Ultraverse Network will be from the collector’s angle … I have spent years trying to track down all these books and a big part of that was figuring out which books actually existed. So we’ll start from the top with the gold holographic covers. To me, these are the books to have. 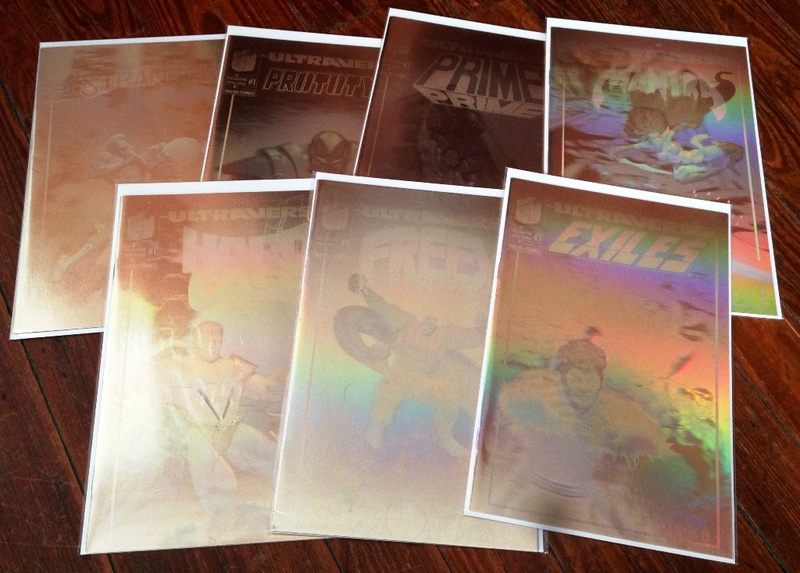 The silver holographic books are the ones most people remember, since they were distributed for the first issues of seven launch titles: Prime, Mantra, Hardcase, Strangers, Prototype, Exiles and Freex. Malibu printed 5,000 of each of these to be given out as retailer and fan incentives. These were quite the hot ticket back in the mid-1990s! But I never even knew the golds existed until a few years ago when I started spotting them online. You don’t see them very often, but they are out there. According to a post from the Ultraverse Facebook group, Malibu publisher Scott Mitchell Rosenberg was asked at the 2012 San Diego Comic Con for the story behind the gold covers. He said there were 200 printed of each of the seven titles, also to be given out as incentives. Nobody really knows how many were actually distributed. I’m guessing a bunch of them were tossed out when Malibu was closed down after the Marvel purchase but I don’t know that for sure. Some are easier to find than others. My entirely unscientific observation from years of following eBay auctions is that the easiest to spot are Mantra, Protoype and Exiles. Freex is a little tougher. Prime is tougher still. And Hardcase and Strangers are really rare. In a typical year I see anywhere from 10-20 auctions with these. Last year somebody sold 10 gold Mantras in a single batch(the auction said it was some type of warehouse find). Five years ago a set of all seven sold for $150; this year individual golds have been selling for up to $40. It’s not impossible to put together a set, but it will take a lot of time and effort unless you just get lucky (like the dude who got all seven at once). By the way, these books are beautiful! Holograms were not that unusual back then, but the effect works stunningly well when it takes up the entire cover. One note about the Ultraforce holographic cover. It’s also gold, but was printed seperately. There is no silver version of this book, and there are 5,500 golds. It’s easy to find; I bought 20 from Mile High for $32 total in 2007. So lets just not include that book when we are talking about the others.